The time of year is approaching when Indonesia's major cities are suddenly emptied of millions of their inhabitants, before being just as suddenly filled with even more people than before. 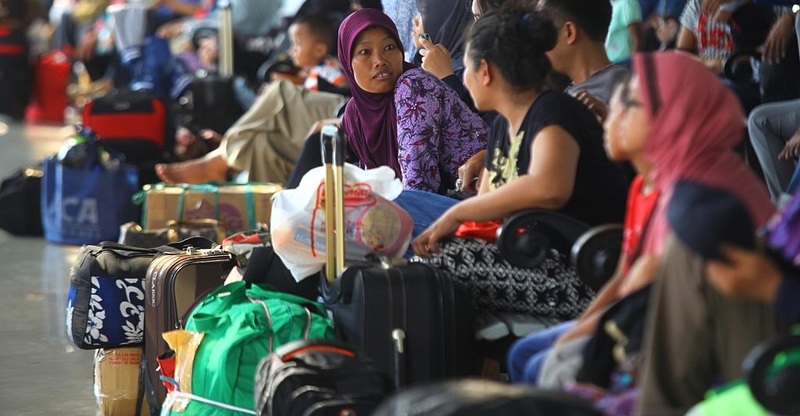 This phenomenon is known as 'mudik'; the tradition of city-dwellers returning to their rural hometowns at the end of the Islamic holy month of Ramadan to spend Idul Fitri (Eid-al Fitr) with family. At the end of the holiday, many returning city-dwellers are accompanied by friends or family wanting to try their luck in the city. In Jakarta, mudik highlights the diversity of people in the capital, as friends and colleagues return to far-flung islands across the Indonesian archipelago. It also highlights the unequal spread of development and resources in the country, as many rural-dwellers travel great distances on strained transport infrastructure to the city to look for better paid work to support their families. As many as 18 million people are expected to be on the road over the holiday period, which officially begins next Wednesday. President Jokowi this week travelled to one of the most remote provinces in Indonesia, the Riau Islands, in what was initially billed as a visit to discuss the province's economic development. But this wasn't your typical development drop-in. The president arrived at the province's Natuna Islands regency on a navy warship, accompanied by some of his highest-profile ministers, including Security Minister Luhut Pandjaitan, Foreign Minister Retno Marsudi, and Maritime Affairs Minister Susi Pudjiastuti (who has gained a reputation at home and abroad for her explosive approach to illegal fishing boats in Indonesian waters). After some discussion on board the navy ship, the cabinet members released a statement revealing the not-so-subtle subtext of their visit; that it was an affirmation of Indonesia's sovereignty over the Natuna Islands. The Indonesian navy has clashed with three Chinese fishing boats off Natuna Islands in the past three months. The most recent involved the navy firing warning shots, which China says injured one person. China does not dispute Indonesia's territorial sovereignty over the islands. But after the last stand-off at sea, China's foreign ministry said the two countries held 'overlapping claims' to some waters off the islands. Previously, the waters were also referred to as Chinese 'traditional fishing grounds'. Indonesia maintains that the waters are part of its Exclusive Economic Zone, as defined by the United Nations. The president's symbolic visit could be the strongest move yet from Indonesia on competing claims for territory in the South China Sea. Until now, Indonesia has kept its distance from regional disputes over China's 'nine-dash line', preferring to engage via ASEAN rather than on bilateral terms. But with a verdict expected this month from The Hague in an international arbitration case against China lodged by the Philippines, Indonesia appears to be more assertively staking out its territory. Meanwhile, lessons have been drawn from the UK's Brexit decision this week for ASEAN, as a regional body for Southeast Asia. Vice President Jusuf Kalla warned against the 'protectionist spirit' of Brexit. The decision comes at a time when ASEAN is trying to promote its economic community, which would free up movement of skilled labour in the region. Aside from immediate effects on currency exchange, the Brexit decision is predicted to have little impact in Indonesia, since bilateral ties between the two countries remain strong and trade is limited. However, development aid is one area predicted to take a hit from the change. This was a year of extraordinary diplomacy on the Korean peninsula, summitry and circuses. If you're frustrated that this dispute seems stuck with no way out, here are two things worth thinking about. The arrest of the Canadian researcher sends a chill China-watching communities around the world.